When you have a child, a romantic dinner for two is something to cherish. Frankly, it's as rare as hens teeth. I love Lucas dearly, but it's a fact that any meal involving him will involve some sort of fuss about something. So when Lucas was invited to sleepover at Nanny and Granddad's last night, Dave seized the opportunity to invite me out for dinner. 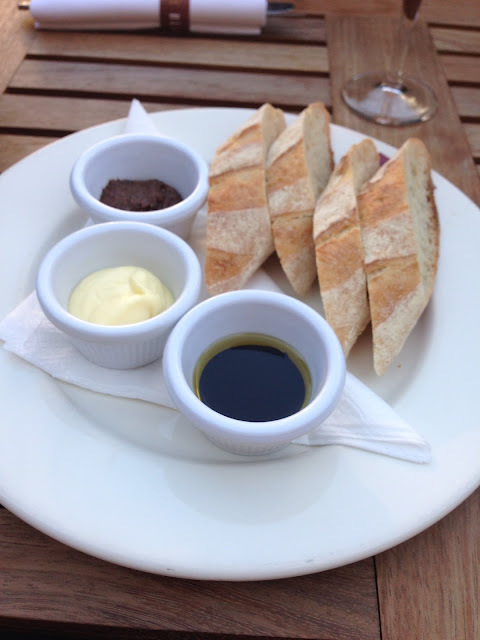 We shared an appetiser plate of saffron garlic mayonnaise, tapenade, olive oil with balsamic vinegar and slices of baguette for dipping. My favourite was the saffron garlic mayonnaise which was incredibly rich with a soft hint of garlic rather than the big hit you usually get from aioli. I would have liked the tapenade more if it was a little looser, as it stubbornly refused to cling to the bread when I dipped. 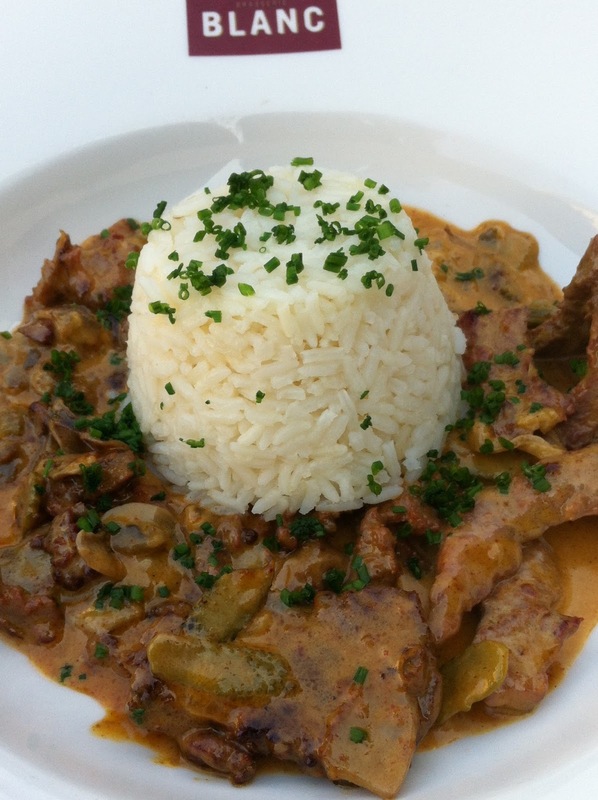 For my main course, I went for a simple, yet delicious beef stroganoff with fluffy-as-a-cloud rice. I've never seen such wafer-thin mushrooms. The beef was seriously tender and full of excellent beefy flavour. 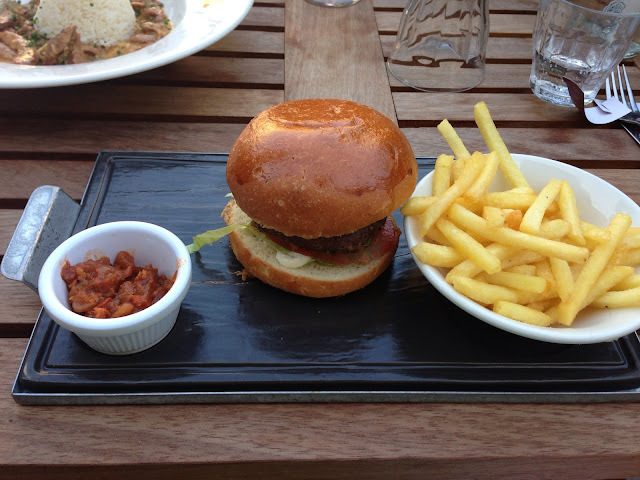 On first glance the portion size looked a little small but it was pretty much perfect in the end. Dave opted for the Blanc Burger, a brioche bun, with a coarsely ground beef burger, Comte cheese and some pickles. Look at the gloss on the brioche! Isn't it amazing? Glossy as the bun was, Dave said it wasn't quite as buttery as it should have been, but the burger was still excellent nonetheless. I can honestly say that we've never chosen dessert so swiftly before. As soon as I saw Baked Alaska on the dessert menu, I turned to Dave and wiggled my eyebrows meaningfully. "Yeah, go on then," he said. I love my husband. For years I used to make a gloriously and absolutely gluttonously huge Baked Alaska for Dave's birthday, before I progressed into ridiculously elaborate cakes. So it felt so decadent to have someone else prepare one of our favourite desserts for me. 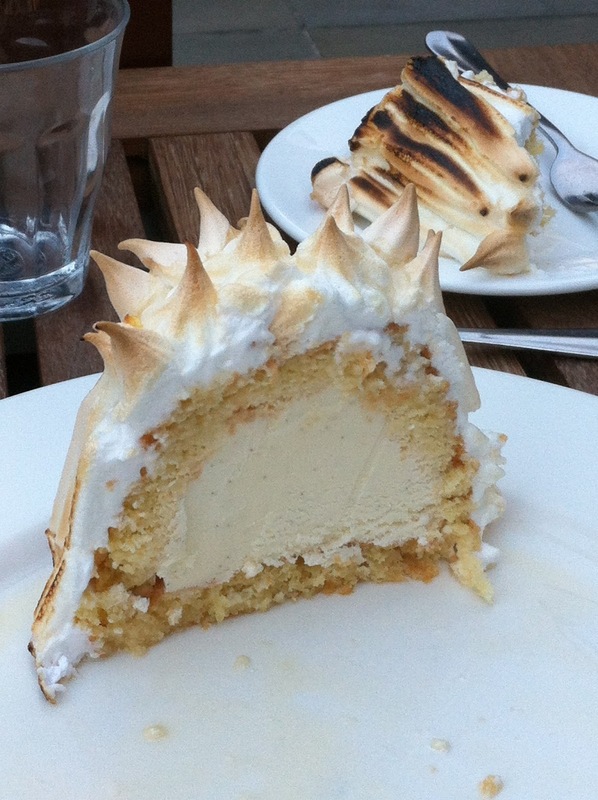 Sadly, since we were sitting outside, it was too bright to see the flames licking at the meringue, but I could feel the heat and smell the Grand Mariner sizzle, so it was all good. Ohmygod this was amazing! Our waitress was absolutely thrilled that we'd ordered it and practically bounced off to place our order after telling us that it was, "the best dessert ever." I'd have to say that it was "the best Baked Alaska ever" as I have very, very fond memories of an exquisite bowl of chocolate mousse in Venice and pistachio semifreddo at Le Manoir. The Grand Mariner soaked beautifully into the sponge and really complemented the vanilla ice-cream in the centre of the Alaska. Orange and vanilla is a fantastic combination and with the small sweet bite of the liqueur it was a fantastic dessert! It was a lovely night out; relaxed, comfortable and sweet. I would certainly go back again for a quiet dinner for two. It really was, and it was lovely to eat outside on such a balmy summer's evening. 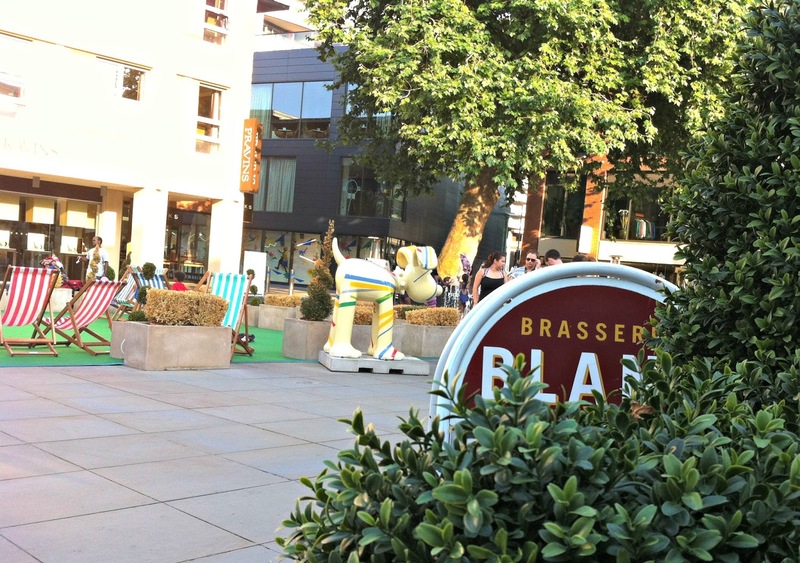 Ach, I am a stupidly enormous Raymond fan and STILL haven't been to a Brasserie Blanc. Will be hunting down my nearest one now though, looks fab! I was a massive Raymond Blanc fan until I watched "The Restaurant" on BBC2. I was so disappointed in his choice of winners, who were utterly dreadful cooks and restaurateurs (the cocktail boys, if you watched it), that I rather went off him as a person. 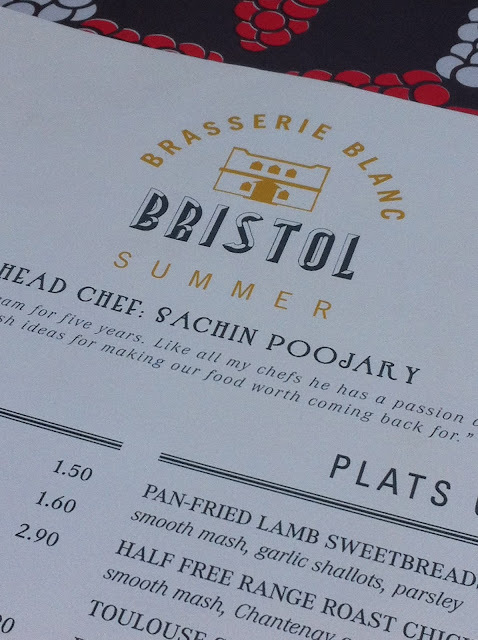 Still, his food is very tasty, even if his forays into TV aren't always palatable! We went to Le Manoir for our first wedding anniversary and the food was absolutely amazing with incredible service, too. looks delish!!! Thanks for sharing on this #LOBS,weekend!